An Engaged Gluteus Maximus aids Correction of the Patella Q Angle and Collapsed Arches (Flat Feet), & is Nature's Answer to Custom Orthotics. Engaging Gluteus Maximus and Minimizing Foot and lower Leg Injuries. Many of the bare-foot benefits can be achieved and maintained by incorporating a short once weekly run or brisk walk on rough ground, and by learning and applying the healthy type of walking/running that the pain will teach you - Yes, it is painful on the soles of the feet, And yes, the pain does teach. Let me share with you my experience of 3 months of bare foot running. The ankle no longer goes to the extreme of dorsi-flexion (toe still high off the ground when the heel starts to weight bear). The knee no longer goes to the extreme of extension. In summary, your full body weighting at foot strike is experienced on the mid foot with the body more nearly over the foot rather than behind it and coming forward over it. This is good running technique(17). Tibialis Posterialis Tendinosis (Another Flat Footed Syndrome). Shin Splints and Anterior Compartment Pressure Build up. Peri-Patella Pain and the "Q-Angle"
Tensor Fascia Lata - Iliotibial Band (TFL-ITB)Strain and Trochanteric bursitis. The foot lands on its full surface and not just the heal: that makes it a more stable platform. The sole of the foot gets a greater sensory input, which tends to trigger the ballancing responses in the Gluteus maximus and foot and lower limb (see"Bare-foot Walking Exercise" already discussed in this article). Engaged gluteus will help, because during one legged stance, the gluteal muscle is a hip abductor/lateral rotator muscle and will minimize the "hip adduction with medial hip rotation" at heel strike that makes you vulnerable to ankle twist (see pictures of Ankle Sprain Prevention below). Pictures of Ankle Sprains: Diagram left: Hip adducted and femur medially rotated. Ankle twist occurs easily with this directional susceptibility of movement. Diagram Right: Hip not adducted and femur laterally rotated. The ankle is not about to twist! 2. Plantar fasciitis due to Flat Feet. 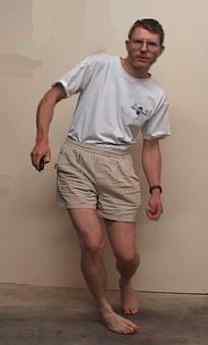 ...is hip medial rotation (with or without hip adduction) accompanied by foot pronation (flat feet). Don't be put off by the technical description. The movement pattern is extremely easy to recognise! You could call it "knock knees". You can see it in the lower picture to the right. Sit to Stand Movement with Gluteus maximus engaged and foot arches fully formed. Sit to Stand Movement with the Gluteus maximus not engaged and the foot arches collapsing into Foot pronation. The medial (inside arches) of the foot are taking the weight. In plantar fasciitis, it is the ligaments on this side that become injured due to increased loading. In the runner, maximal shock wave jarring of the foot arch ligaments and muscles occurs just before "toe-off". If "toe-off" is performed with the knee collapsing inwards and on a flat foot, then the shock wave jarring, - and therefore the loading - is transmitted through the medial (big toe) side of the foot arch. Combine this "lop-sided" jarring of the foot arch with poor foot arch muscle strength (weak foot arch muscles are commonly associated with expensive running shoes and custom orthotics), and you can understand why the ligaments and tendons between the big toe and the heel are strained. The foot arch muscles respond to the pain of this tendon and ligament damage by shortening into continuous spasm, so that even when you are sleeping, the ligaments are under tension and not able to pull their partially torn ends together for healing to occur. so that the night time punishment inflicted by those spasming muscles makes plantar fasciitis treatment all the more slow and difficult. To avoid plantar fasciitis, and similarly to provide an effective plantar fasciitis treatment, you need to avoid "knock knees" during all stages of walking and running, and work on the strength and competence of the foot arch muscles and calf muscles. To avoid knock knees, your Gluteus maximus must engage at "foot fall" and during the sit to stand manoeuver. The Posterior tibial muscle contributes to the formation of the foot arch (see diagram). The discussion under :"Plantar fasciitis treatment" (see above) regarding the faulty posture-movement pattern of "hip adduction with medial rotation" can be applied equally to the posterior tibial muscle. I would argue that the cause of Tibialis Posterialis Tendinosis is very similar to the cause of plantar fasciitis. 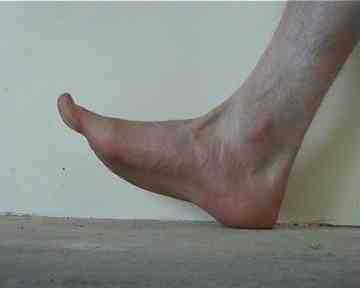 Certainly, both conditions are associated with flat feet, and are more painful after lying down, i.e. both conditions have a muscle splinting component due to irritation at their tendinous attachments. 4. Shin Splints and Anterior Compartment Pressure Build up. Gluteal contraction alone tends to do this too. Mid foot landing (see pictures below) means that the anterior compartment muscles (at the front of the shin) do not have to work so hard. When the anterior shin muscles are not called upon to work hard, they are less likely to develop "shin splints" and anterior compartment syndrome. (I have certainly found this to be true for myself). The heel landing of the shoed runner tends to be with a fully flexed ankle, and this means that the muscles inside the anterior compartment (front of the shin) are being requested to contract maximally at their shortest length, where they are weakest. Whereas with mid foot landing, the anterior compartment muscles are working at their mid-range, where they are at their strongest. In addition, with mid-foot landing, they are not being called upon to do a full range of movement, nor are they being asked to be the prime stabilizers for a long period of time, so that they are not working so hard. Diagram 1: Westerner's heel strike. Note the dorsi-flexion. Ball of toe still well above ground. 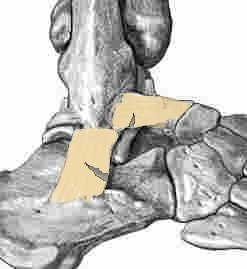 Diagram 2: Westerner's foot at moment of Foot "Slam down". Lower leg is still tilted backward, and the ankle is not in its strong middle position. Diagram 3: Bushman's foot touchdown. Minimal dorsiflexion, and the ball of the toe is already close to the ground. Diagram 4: Bushman's foot at the moment of Foot "Touchdown". It doesn't "slam down", and the ankle is in its strong middle position. The short muscles within the arch of the foot (there are four layers of them, comprising 50 individually named muscle units!!!). The long muscles which are housed in the tibial posterior compartment (Tibialis posterialis and the long flexors of the toes). For the author's experience with mild posterior tibial tendinosis, refer to the appendix to this article "Pain Free Running in Just Three Months!" "...peri-patellar pain [is] attributed to excessive shock loading of the limbs. When running barefoot on hard surfaces, the runner compensates for the lack of cushioning underfoot by plantar-flexing the foot at contact [probably better described in terms of avoiding excessive dorsi-flexion and foot "slam down"], thus giving a softer landing(4)". The "softer landing" described above may well be so, but peri-patella pain is often a symptom of excessive "Q" or Quadriceps angle. 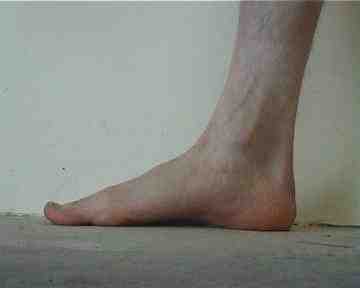 Excessive "Q" angle is associated with "flat foot", and tibial medial rotation(13). What is not generally recognised is that femoral medial rotation is also a contributor to excessive "Q" angle, and that "engaging Gluteus maximus" (which is a powerful lateral rotator of the femur) will help correct femoral medial rotation and significantly reduce the Q angle and associated peripatella pain. That is a lot to take on board! - The diagrams in the next section should make things clearer. "Q" Angle defined: The "Q" angle is the angle between a line drawn through the patella tendon and a line drawn through the Rectus femoris (see picture to right). It should be less than 20 degrees in men and less than 25 degrees in women(13). The "Q" angle is increased to potentially harmful levels when the femur rotates medially and the foot arch collapses (see diagram). Standard medical therapy involves taking comfortable shoeing to yet another extreme, with custom orthotic to correct flat feet and support the "collapsed" foot arch, and thereby combat the medial rotation of the tibia. This does work, but like many physical and surgical support strategies will never be 100% successful without attention to optimization of muscle function and body positioning. A better answer is to "engage Gluteus maximus at heel strike", and to form the foot arches. The shoe inserts (custom orthotics) should be a last resort. 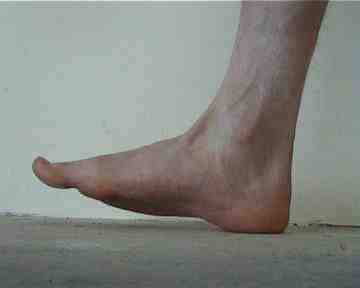 Q angle measurement for a subject instructed to "relax the gluteals and let the foot arch flatten". The angle is 24 degrees. 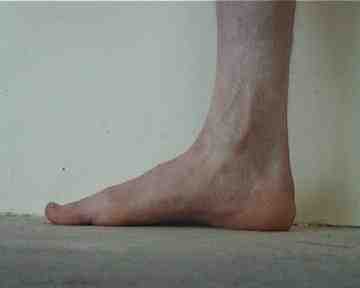 Q angle measurement for the same subject instructed to "tense the gluteals and form the foot arch". The angle is 15 degrees. Note: The subject above has "Pes anserinum bursitis" of his left knee. This is associated with his excessive resting Q-angle. Pain over the medial knee is the key symptom, and this has greatly reduced with the help of "bare-foot" running sessions combined with "contracting Gluteus maximus at heel strike" throughout the day. (See appendix "Pain Free Running in Just Three Months!"). 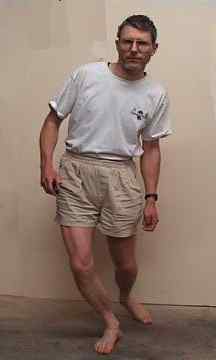 "Stressed ilio-tibial band syndrome ... [is] attributed to excessive shock loading of the limbs. When running barefoot on hard surfaces, the runner compensates for the lack of cushioning underfoot by plantar-flexing the foot at contact [probably better described in terms of avoiding excessive dorsi-flexion and foot "slam down"], thus giving a softer landing(4)". And the better Reason... Bare-foot running does reduce the shock loading of the limb, but a clinical anatomy book graphically portrays the better reason. In the picture to the right, we see the Iliotibial band together with the muscles that tension it. 80% of the fibres of the Gluteus maximus insert onto the Iliotibial band, or ITB (3). If the Gluteus maximus is none functional, that leaves the Tensor fascia lata (TFL) and the tendinous portion of the ITB that originates from the hip bone to take the abductor loading of single leg stance. When this huge muscle is not contributing to the load sharing, it is small wonder that the remaining portion of the TFL and ITB becomes strained! Please note: if you are suffering from TFL-ITB strain, or Trochanteric bursitis, do not immediately go overboard with Gluteal contraction! A gradual approach is required, which incorporates improvement of the function of a number of muscle groups together with correction of "hip adduction with medial rotation" (already referred to in this article). The reader is referred to the relevant case study in Professor Sahrmann's text(3), and some exercises are suggeted below. In this article, you have learned the consequences of poor function of the gluteus maximus. You may have some idea that your own lack of gluteal development is contributing to pain or dysfunction. You may be wondering what you should do about it. The printable Pilates Exercise Instructions listed below (and on the previous three pages)will be a great place to start! If you have any comment, queries or critique, please contact me! Here is wishing you the very best of "Bushman's buttocks"!!!! The key message from this online article: The solution for 'Structural" leg Problems is a strong and functional Gluteus maximus, alongside strong and functional foot arches and Posture-Movement Optimization! The following free pilates exercises were instrumental in "fixing" my lower back pain, and flat feet/plantar fasciitis. As I have already stated, I have thrown away my custom orthotics, and you may be able to do the same - subject to the advice of your health care professional. I encourage you to print the following exercises off and put them into your daily routine! The Monkey (Gluteus maximus workout). The Runners Squat (Gluteus maximus workout). Up and Down with a Tennis Ball(Composite exercise). Have I helped you achieve your goal of freedom from "structural" leg pain? Film Footage of Bushman Walking and Running! "If you're willing to laugh at yourself, pick these up!"